2 / 366 - Today was my birthday and not only was I spoilt rotten, my parents came to stay and last night was treated to dinner in a local Indian restaurant. It was a bit of a miserable day weather wise so while the family was visiting we took the opportunity to go through some photos taken during various functions last year. 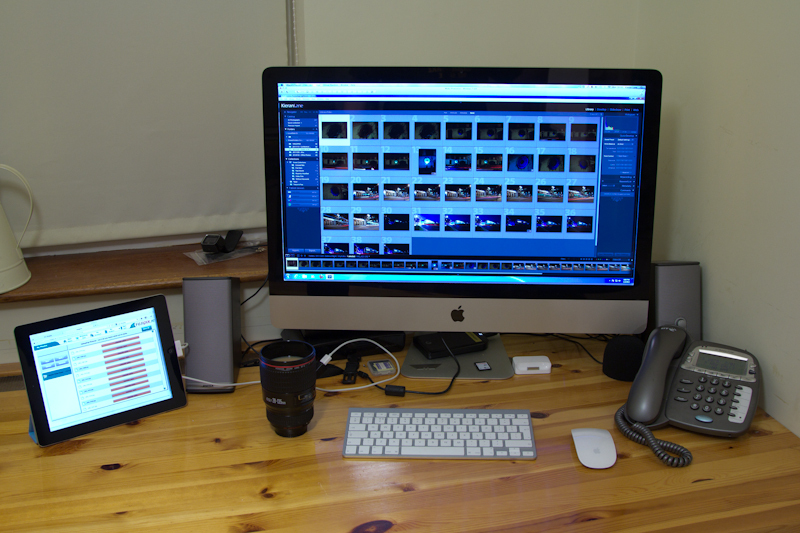 So today’s photo is my office as it looks currently, showing my iMac uploading photos to FujiPix for printing. The upload status is on the iPad which is acting as a secondary display using Avatron Air Display. For a change my desk is quite tidy (all the junk is piled just out of view of the camera). Also in the picture you might notice the new mug that @Karen_ONeill bought for my birthday. 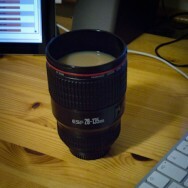 A replica Canon EF-S 28-135mm lens, it’s now going to take pride of place on my desk in work. That way I can hopefully not try pouring tea into my actual lens.